A Cattle drive involved cowboys on horseback moving herds of cattle long distances, usually to market. It was a major economic activity in the frontier stage of the American southwest, especially 1866-95, when 10 million cattle were herded from Texas to railheads in Kansas for shipments to stockyards in Chicago and points east. Because of extensive treatment in fiction and film the cowboy became the worldwide iconic image of the American. Europe had few cattle drives but the Swiss in the 16th century operated one over the St. Gotthard pass to the markets in Bellinzona and Lugano and into Lombardy in northern Italy. The drives ended by 1700 when sedentary dairy farming proved more profitable. Long-distance cattle driving was traditional in Mexico, California and Texas. The Spaniards had established the ranching industry in the New World, drove herds northward from Mexico beginning in the 1540s. In the 18th century and on into the 19th the small Spanish settlements in Texas derived most of their meager revenue from horses and cattle driven into Louisiana, though such trade was usually illegal. Meantime in the United States, herds were sometimes driven long distances. In 1790 the boy Davy Crockett helped drive "a large stock of cattle" 400 miles from Tennessee into Virginia; twenty years later he took a drove of horses from the Tennessee River into southern North Carolina. Long-distance herding of hogs was also common. In 1815 Timothy Flint "encountered a drove of more than 1,000 cattle and swine" being driven from the interior of Ohio to Philadelphia. The stock in the states was gentle, often managed on foot. The history of trail driving involves horses as well as cattle. Texans established trail driving as a regular occupation. Before they broke away from Mexico in 1836, they had a "Beef Trail" to New Orleans. In the 1840s they extended their markets northward into Missouri—Sedalia, Baxter Springs, Springfield, and Saint Louis becoming the principal markets. During the 1850s emigration and freighting from the Missouri River westward demanded great numbers of oxen, the firm of Russell, Majors and Waddell in 1858 utilizing 40,000 oxen. Texas longhorn steers by the thousands were broken for work oxen. Herds of longhorns were driven to Chicago, and one herd at least to New York. After 1865 cowboys drove herds of longhorn cattle over the Chisholm Trail to the railheads in Kansas; they were replaced with hybrid short-horned breeds after 1900. The gold boom in California in the 1850s created a demand for beef and the cash to pay for it, so very long drives were attempted. Australians began cattle drives to ports for shipment of beef to San Francisco and, after freezing methods were developed, all the way to Britain. In 1853 Italian aristocrat Leonetto Cipriani undertook a drive from St. Louis to San Francisco along the Oregon-California trail; he returned to Europe in 1855 with large profits. During the Civil War before the Union seized the Mississippi in 1863 , Texas drove cattle throughout the states for the Confederate forces. In October, 1862, a Union naval patrol on the southern Mississippi River captured 1,500 head of Texas longhorns, which had been destined for Confederate military posts in Louisiana. The permanent loss of the main cattle supply left the Confederate armies hungry. At the close of the war Texas had probably 5 million cattle—and no market. Late in 1865 a few cowmen tried to find a market. In 1866 there were many drives northward without a definite destination and without much financial success; also to the old but limited New Orleans market, following mostly well-established trails to the wharves of Shreveport and Jefferson (Texas). In 1868, David Morrill Poor, a former Confederate officer from San Antonio, Texas, drove 1,100 cattle from east of San Angelo into Mexico over the Chihuahua Trail. This event, the "Great Chihuahua Cattle Drive," was the largest cattle drive attempted over that trail up to that time, but the market was much better in Kansas than in Mexico, so most drives headed north. In 1867 Joseph G. McCoy opened a regular market at Abilene, Kans. The great cattle trails, moving successively westward, were established and trail driving boomed. In 1867 the Goodnight-Loving Trail opened up New Mexico and Colorado to Texas cattle. By the tens of thousands they were soon driven into Arizona. In Texas itself cattle raising expanded rapidly as American tastes shifted from pork to beef. Caldwell, Dodge City, Ogallala, Cheyenne, and other towns became famous because of trail-driver patronage. The Chisholm Trail, starting in 1865, was the most important route for cattle drives leading north from the vicinity of Ft. Worth,Texas, across Indian Territory (Oklahoma) to the railhead at Abilene, Kansas. It was about 220 miles and long generally followed the line of the ninety-eighth meridian, but never had an exact location, as different drives took somewhat different paths. The Chisholm Trail decreased in importance after 1871, when Abilene lost its preeminence as a shipping point for Texas cattle, as a result of the westward advance of settlement. Dodge City, Kansas, became the chief shipping point and another trail farther west, crossing the Red River near Doan's Store, Texas. The extension of the Atchison, Topeka and Santa Fe Railway to Caldwell, Kansas, in 1880, however, again made the Chisholm Trail a most important route for driving Texas cattle to the North, and it retained this position until the building of additional trunk lines of railway south into Texas caused rail shipments to take the place of the former trail driving of Texas cattle north to market. The cow towns flourished 1866-1890. The first was Abilene, Kans. Other towns in Kansas—Wichita, Hays, Ellsworth, Newton, Caldwell, and Dodge City—succeeded Abilene or shared its patronage by riders fresh off the long trail. Hunnewell, Missouri; Ogallala, Nebraska; Cheyenne, Wyoming; Miles City, Montana; and Medora, North Dakota, served the trade as well. In the 1880s Dodge City boasted of being the "cowboy capital of the world." Abilene, Tascosa, Amarillo, Fort Worth, and Wichita Falls, all in Texas; and Prescott, Arizona; Greeley, Colorado; and Las Vegas, New Mexico were regionally important. The most famous cow towns like Abilene were railheads, where the herds were shipped to the Chicago stockyards. Many smaller towns along the way supported range lands. Many of the cow towns were enlivened by buffalo hunters, railroad construction gangs, and freighting outfits during their heyday. Cattle owners made these towns headquarters for buying and selling. Cowboys, after months of monotonous work, dull food, and abstinence of all kinds, were paid off and turned loose. They howled, got shaved and shorn, bought new clothes and gear. They drank "white mule" straight. Madames and gambling-hall operators flourished in towns that were wide open twenty-four hours a day. Violence and ebullient spirits called forth a kind of "peace officer" that cow towns made famous—the town marshal. Wild Bill Hickok and Wyatt Earp were perhaps the two best-known cow-town marshals. The number of killings was, however, small by the standards of eastern cities. During the 1870s the buffaloes died out and the buffalo hunting Indians of the Plains, unable to hunt, were resettled on reservations. An empire was left vacant. It was first occupied by Texas longhorns, driven by Texas cowboys. The course of empire in America has been west, but over much of Oklahoma, Kansas, Nebraska, the Dakotas, Wyoming, Montana, and parts of Nevada and Idaho the precursors of this movement were trail men from the South. The Long Trail extended into Canada. The killer winter of 1886-87 wiped out the open-range cattle business in Montana and the upper Great Plains. In the 1890s herds were occasionally driven from the Panhandle of Texas to Montana. The Texas longhorn was replaced with hybrid breeds that produced more meat. Trail driving virtually ended in 1895. Barbed wire, railroads, and farmers ended it. Australia is noted for long drives. Patsy Durack, for instance, left Queensland for the Kimberleys in Western Australia in 1885 with 8,000 cattle, arriving with only half that number some two years and two months later, completing a drive of some 3,000 miles. Indeed, long cattle drives continued well into the latter half of the twentieth century. 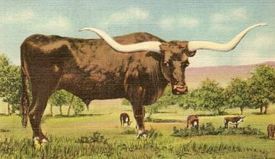 During three swift decades it had moved over ten million cattle and one million range horses, stamped the entire West with its character, given economic and personality prestige to Texas, made the longhorn historic, glorified the cowboy over the globe, and endowed America with its most romantic tradition relating to any occupation. The best known cowboy writers include Theodore Roosevelt, who lost his inheritance ranching in the Dakotas in the 1880s, Will Rogers, the leading humorist of the 1920s, and Indiana-born Andy Adams (1859-1935), who spent the 1880s and 1890s in the cattle industry and mining in the Great Plains and Southwest. When an 1898 play's portrayal of Texans outraged Adams, he started writing plays, short stories, and novels drawn from his own experiences. His The Log of a Cowboy (1903) became a classic novel about the cattle business, especially the cattle drive. It described a fictional drive of the Circle Dot herd from Texas to Montana in 1882, and became a leading source on cowboy life; historians retraced his path in the 1960s, confirming his basic accuracy. His writing is acclaimed and criticized for their fidelity to truth and their lack of literary qualities. The cowboy's distinctive working gear, most of it borrowed from the Mexican vaquero, captured the public imagination. His high-crowned sombrero, high-heeled boots, leather chaps, six-shooter, lariat, and spurs were functional and necessary in the field, and fascinating on the movie screen. Increasingly the public identified the cowboy with courage and devotion to duty, for he tended cattle wherever he had to go, whether in bogs of quicksand; swift, flooding rivers; or seemingly inaccessible brush. He rode with lightning and blizzard, ate hot summer sand, and was burned by the sun. Theodore Roosevelt conceptualized the herder as a stage of civilization distinct from the sedentary farmer—a classic theme well expressed in the 1955 film "Oklahoma!" Roosevelt argued that the manhood typified by the cowboy—and outdoor activity and sports generally—was essential if American men were to avoid the softness and rot produced by an easy life in the city. The cow towns along the trail were notorious for providing liquor and female company to the cowboys; they usually were not allowed to drink on the trail itself. Historians have vigorously debated just how violent these towns were. The great cattle drive movie was "Red River" (1948) directed by Howard Hawks, starring John Wayne and Montgomery Clift, which depicted the first great drive on the Chisholm Trail. The western film and TV theme faded after 1970 but in 1989 the Great Montana Centennial Cattle Drive celebrated history and raised money for a college scholarship fund as 2,400 people (including a handful of real cowboys), 200 wagons and 2,800 cattle plodded 50 miles in six days from Roundup to Billings along a major highway. Allmendinger, Blake. The Cowboy: Representations of Labor in an American Work Culture. (1992). 213 pp. Clayton, Lawrence; Hoy, Jim; and Underwood, Jerald. Vaqueros, Cowboys, and Buckaroos. (2001) 274 pp. Denton, Ivan. Old Brands and Lost Trails: Arkansas and the Great Cattle Drives. (1992). 261 pp. Evans, Simon; Carter, Sarah; and Yeo, Bill, eds. Cowboys, Ranchers, and the Cattle Business: Cross-Border Perspectives on Ranching History. (2000). 232 pp. Rollins, Philip Ashton. The Cowboy: An Unconventional History of Civilization on the Old-Time Cattle Range. (1922, reprint 1997). 402 pp. Slatta, Richard W. Cowboys of the Americas. (1990). 306 pp. Corkin, Stanley. Cowboys as Cold Warriors: The Western and U.S. History. (2004). 273 pp. Dippie, Brian W., ed. Charlie Russell Roundup: Essays on America's Favorite Cowboy Artist. (1999). 328 pp. Savage, William W., Jr. The Cowboy Hero: His Image in American History and Culture. (1979). 179 pp. Smith, Andrew Brodie. Shooting Cowboys and Indians: Silent Western Films, American Culture, and the Birth of Hollywood. (2003). 230 pp. Tompkins, Jane. West of Everything: The Inner Life of Westerns. (1992). 245 pp. Walker, Don D. Clio's Cowboys: Studies in the Historiography of the Cattle Trade. (1981). 210 pp. Cattle Raisers Association of Texas. History of the Cattlemen of Texas. (1914, reprint 1991). 350 pp. Lanning, Jim and Lanning, Judy, eds. Texas Cowboys: Memories of the Early Days. (1984). 233 pp. Logsdon, Guy, ed. "The Whorehouse Bells Were Ringing" and Other Songs Cowboys Sing. (1989). 388 pp. McCoy, Joseph G. Historic Sketches of the Cattle Trade of the West and Southwest (1874, reprint 1940). McCoy opened the first railhead to large shipments of Texas cattle in 1867. Stanley, David and Thatcher, Elaine, eds. Cowboy Poets and Cowboy Poetry. (2000) 392 pp.